Managing documents, videos and links in your LMS. It seems to me that with our industry’s focus on Mobile and Social Learning, people are often overlooking some great opportunities to effectively integrate their existing documents, videos and websites (links) into the formal training delivered via their LMS. • HRIS or CRM integration, etc. These requirements solve the primary business and process challenges that drive LMS adoption. Increasingly, we also see “nice to have” or “must have” requests for mobile and/or social learning. What seems to be missing from most organizations’ LMS deployment strategies, however, is a plan for managing all of their various learner and employee resources in the context of the LMS. 1. A belief held by some L&D practitioners that static learning content (Standard Operating Procedures, HR Policy Documents, Technical Manuals , Marketing Brochures) need to be transformed into interactive e-learning courses if they are to exist in the LMS. I am still seeing LMS projects stalled because people are struggling with how to convert all of this “static” content into “engaging e-learning content”. 2. A belief that these resources are best left in a document management system and not in the LMS. While there are some companies that are spending time and money to integrate their document management system (like SharePoint) with their LMS, it may not be necessary to do so. In some cases, all these organizations want to do is to provide their users with an easy way to access documents or content that is tied to a job position, department or the learning outcomes of a course. Maintaining two different platforms to achieve this may be overkill. 3. They haven’t thought about it yet. A lot of organizations are focusing all of their energy on implementing the LMS to help reduce the administrative workload associated with managing course delivery and tracking. For these people, there is a great opportunity to extract more value from their LMS over time. This should be considered for a future phase of the LMS initiative. Does it really need to be this complicated? One of the cool features of the Absorb LMS is that it provides the ability for administrators to easily create global or course-specific resources through a simple process involving only a few steps. c. As an instructor’s resource associated with a specific course. 2. You can then choose to make the resource visible to all learners in the system (the default) or restrict it to groups of users based on filtering on one or more aspects of the Learner’s profile. 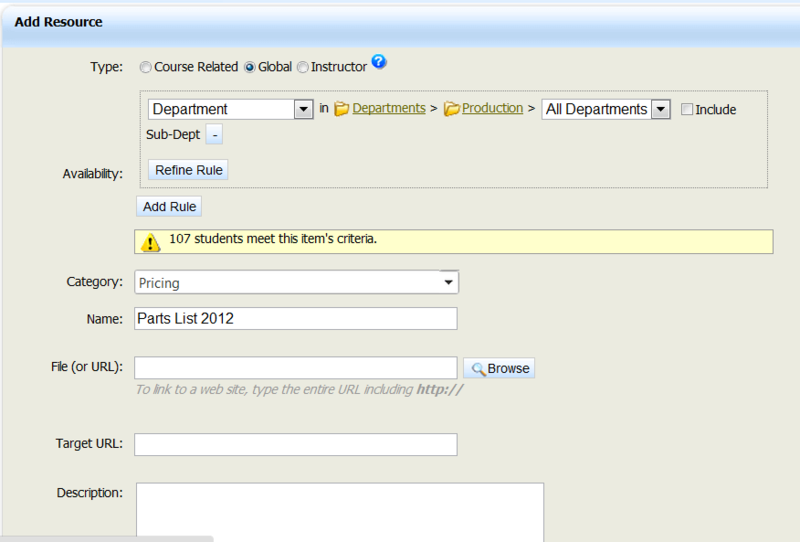 These Learner fields are customizable and can include anything from Company, Department, Location, Job Title, etc. Filters can be fine-tuned and layered for a very flexible set of rules. For example, you could create a resource that is visible to two groups of users, everyone in Human Resources, and everyone with the word “Manager” in their job title. Absorb will display the total number of learners that meet the criteria that you’ve set. In this way, you’ll know instantly if you’ve done something wrong such as set a filter to be too broad or too narrow (affecting too many or too few learners). 3. Upload your file or type in the URL for the resource. 4. Add a description (if you want to). 5. Click “Add” to finish the process. The following image shows an example of creating a Global Resource for the Production Department in the Absorb LMS. Note, the system will place the resource in the “Pricing” category and it will only be visible to the 107 employees in the Production Department. Sometimes, you may want to include a document, hyperlink or video as a lesson within an Online Course, rather than as a Resource associated with a course. In this case, reading the content can be made a mandatory task within the course itself. In this case, you would simply edit the course Outline and insert a new lesson. The lesson will appear as part of the course content, wherever you have placed it in the course structure. If you want to test the learner, you can easily create and insert an Absorb Quiz as the next lesson in the course. You may even want to take things a step further, and allow users to generate their own content, or if you want to incorporate news releases, polls, FAQs and Twitter feeds alongside your learning content, then we would encourage you to take a look at SMARTLAB, which includes a set of learner engagement and Content Management functionality. The great thing is, it’s easy to add resources to Absorb and the process for filtering by audience is exactly the same as the process for setting Self Enrollment rules at the course level.